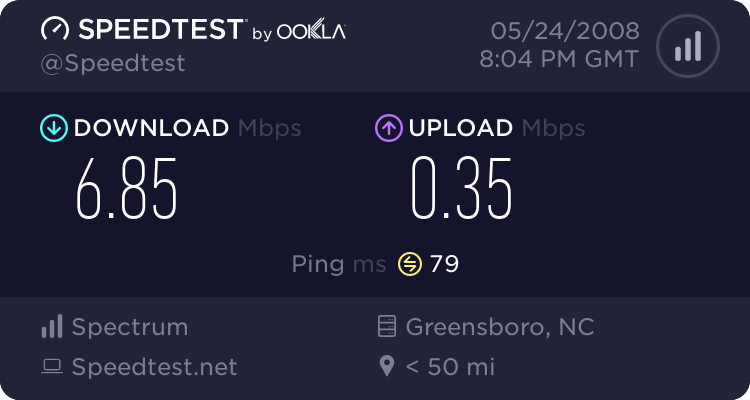 For the longest time my download bandwidth with Time Warner’s Roadrunner service hovered around 5 megs per second but I just recently noticed an improvement when DL’ing large files. I ran a test to confirm my suspicions and sure enough- we now have roughly 7 Mbps of capacity. Seems that the upload is still capped at approximately 384k though. This is great news for those who have the opportunity to work from home. Given the current price of gas I hope that this serves as an incentive for even more companies to allow their employees that benefit. Heck, just working from home one day a week represents a 20% savings on gas with the additional perk of being better for the environment. Turbo (10 bucks more) went from 8mb down to 10.